Contact us if you need a "Chip" programmed. You need to supply your own chip and "Bin" profile..-It doesn't necessarily have to be radio related. 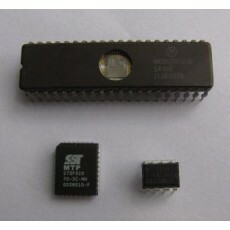 We keep a lot of popular eproms here in stock. Discounts available for job lots. Note: We will only read/copy eproms on Obsolete gear over 20 yrs old, unless you can prove that you are the owner of the profile copyright.